Are sections of your eaves trough or soffit falling off? Are the split seals an eye sore? Have you noticed drainage issues? TDC Roofing’s experienced employees can install seamless continuous 5″ aluminum eaves troughs, soffit and fascia products – in a factory painted, complementary finish - to the exterior of your home or business that will last for years. As well, we can handle wood fascia and flashing repair and replacement. TDC Roofing will assess your problem areas and offer suggestion on possible upgrades and repairs or determine the need for a new install …all to improve the appearance and function of your drainage system. We custom fabricate on site and remove and recycle all waste material. Our multi-talented and professional crew has experience providing quality service to residential, commercial and industrial clients, home builders and contractors. For more information about our eaves trough, soffit, fascia and siding install service; please feel free to call us to request a free estimate. The eaves trough, fascia and soffit products available today offer complete protection and beautification system for your home and will preserve the long-term value of your home for years to come. 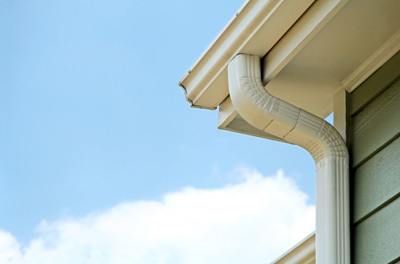 Properly installed gutters and downspouts will control water runoff to preserve your landscaping, prevent basement flooding and controls moisture and rotting problems inherent in some eave and overhang designs. Our gutters and downspouts are trouble-free, built to last, and the seamless construction eliminates troublesome leaks while adding a flawless appearance. Eaves trough cleaning is available year-round and includes the removal and re-installation of your downspouts.